The heat of summer is building up. Each day seems to be hotter and drier. The shade of the trees is something I have been appreciating more each day and today especially since the temperature gauge in my car said it was already 97 degrees. 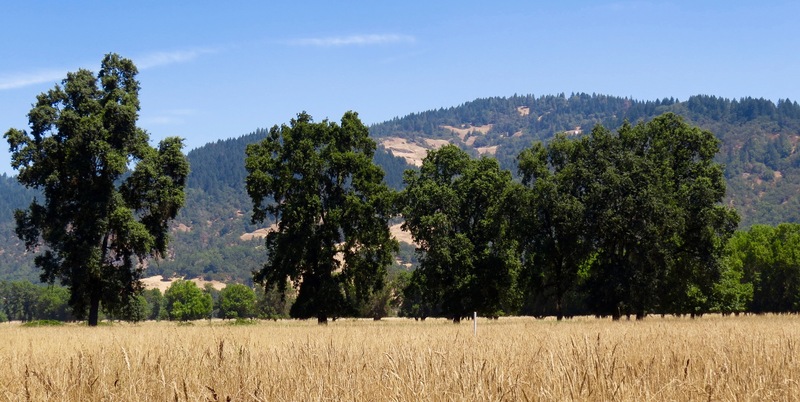 Trees moderate the temperature for lots of creatures including ourselves.I am walking in the area near the historic Coleman House in the middle of the Willits Valley. My focus for today is the Valley Oak woodlands that are found in the bottomland of the valley, where the soil is deepest. The Valley Oak, Quercus lobata, is by far my favorite of the eight common oak species found in California. 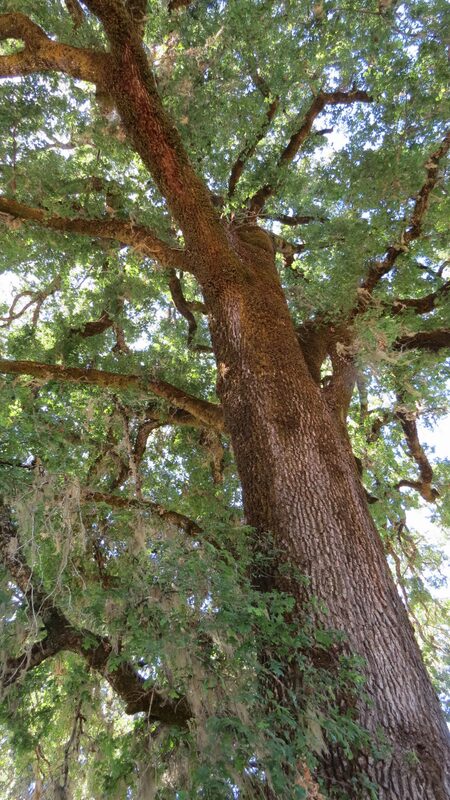 Valley Oak is a long-lived, flood- and drought-tolerant, monoecious, ( both male and female are on the same tree) deciduous ( it loses its leaves in the winter) tree. It is the largest North American oak. Trees are typically 30 to 75 feet (10-25 m) tall and from 1.8 to 2.4 feet (0.5-0.7 m) in d.b.h. but may become much larger. Heading to the eastern border there are some stately and very tall Valley OaksI growing in a spread out line. In my imagination, I try to think of what this area looked like 150 years ago when this was a forest of giant Valley Oaks. I approach one that is almost 100 feet tall. This tree looks vibrant and full of vigor. The pendulous branches reach the ground around me. In the spring there are many birds that use this species for nesting, including Red-tailed Hawks, Ravens. Northern Orioles, Western Kingbirds, Western Bluebirds, White-breasted nuthatches, Oak Titmouse, Acorn Woodpeckers, and many more. In fact, researchers have found that over 67 birds use Valley oaks to nest in and over 300 species of animals use this magnificent tree for food or as a home. Even today, in the middle of a hot summer day, there are birds and insects making sounds in this tree. Oaks provide an important food supply with their acorns and there’s a reason so many peoples have eaten and still eat acorns – they are abundant and really good for you. Some acorns are 18% fat, 6% protein and 68% carbohydrate, equivalent to modern corn and wheat. They are also great sources of vitamin A and C.This is why humans and other animals have been eating acorns for hundreds of years. For me, I just love to lie under a large Valley oak and look up into its canopy, especially in the heat of summer! Looking under one of the leaves I find a variety of Oak galls. The ball-shaped growths that hang from some of the branches are the common Valley oak galls but on the undersides of some of the leaves, there are many different kinds of galls. These galls are an abnormal growth produced by the tree when a small wasp, called a Cynipid wasp, lays its eggs in the tissue of the tree. It is a bit more complicated than that but we will leave it at that. The trees reaction forms the gall which is a casing for the eggs of the tiny Cynipid wasp. There are stem galls and leaf galls on this oak. They come in many shapes and sizes with the apple galls being the largest and then there are horn-shaped, star-shaped, or mushroom-shaped galls. 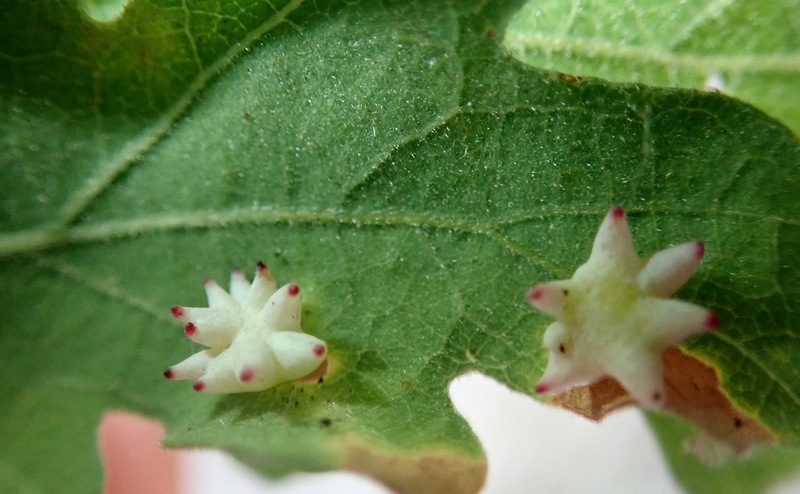 The larvae then hatch and have food to eat while they make their way out of the gall. When I wander out of this cool area I see that around the outside of this tree there are many small oaks coming up and further out in the field there are taller saplings. This makes me feel hopeful for a future where there will be more of these amazing trees. At this point, we only have 1% of the remaining oak woodlands left in California, so this regeneration is a step in the right direction. The oak I just left may be over 200 years old, what has it experienced and lived through? What will the next 200 years bring?